The groundwork is set for a nuclear-free future. US and USSR agree to verifiably ban an entire class of nuclear weapons through the Intermediate-Range Nuclear Forces (INF) Treaty. 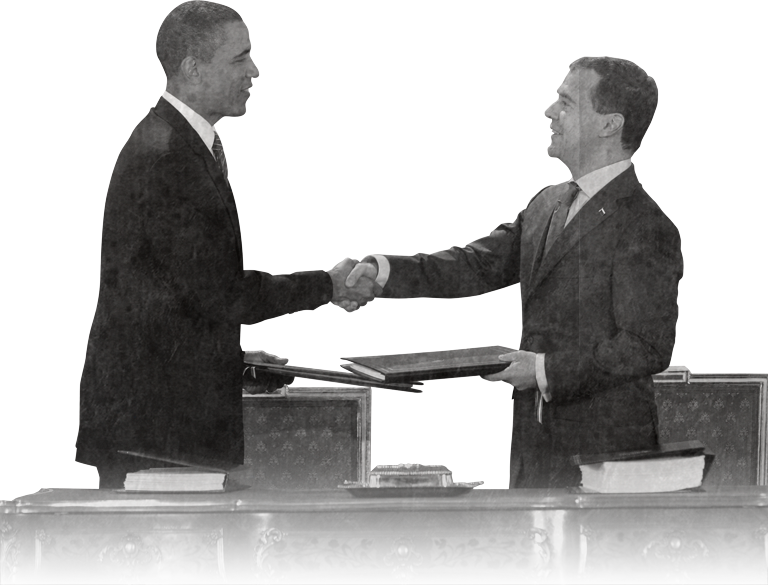 The US and USSR sign the Strategic Arms Reduction Treaty (START I) and agree to limit their deployed nuclear arsenals to 6,000 each. Russia and the U.S. sign the New Strategic Arms Reduction Treaty (New START), limiting deployed nuclear arsenals to 1,550 each. Our main political objective: A treaty among the world’s nine nuclear-armed nations that will remove all nuclear weapons from service by 2030 and ensure they are permanently dismantled by 2045. This won’t happen overnight, but we’ve mapped out a bold plan to get there. [Path 1]: Russia and the U.S. agree to cut nuclear stockpiles to 650 deployed warheads with a cap of 450 reserve warheads each. [Path 2]: Nuclear-armed nations engage in direct talks to strengthen global stability, reduce nuclear risks, and set the stage further stockpile cuts. All agree to never use nuclear weapons first in a conflict. [Off-Ramp]: A backchannel summit of former political and military officials who wield influence with their current governments engage in talks that sitting officials can’t yet commit to undertake. [Path 1]: Russia and the U.S. agree to cut their stockpiles to 300 “off-alert” warheads each, and all other nuclear-armed nations agree to not exceed this new limit. [Path 2]: Nuclear-armed and nuclear-capable nations continue direct talks to further global stability, establish universal fuel cycle safeguards, strengthen monitoring and verification methods to ensure all parties stick to their end of the bargain and develop a framework for the Global Zero Accords. Nuclear-armed and nuclear-capable nations negotiate, sign and ratify the Global Zero Accords, a binding international treaty that removes all nuclear weapons from military service (whether active or reserve) by 2030, and requires the complete destruction of nuclear warheads by 2045. All remaining nuclear weapons are taken offline and permanently retired – warheads separated from their delivery vehicles and securely stored until dismantlement has been confirmed by international monitoring – and all civilian nuclear programs are placed under international monitoring. All remaining nuclear weapons are dismantled, and all weapons-grade uranium and plutonium is diluted and converted for use in civilian energy programs by 2045. Building on decades of successful monitoring and verification programs, implementation of the Global Zero Accords are carefully overseen by international institutions and confirmed by constant surveillance and on-site, no-notice inspections – indefinitely.